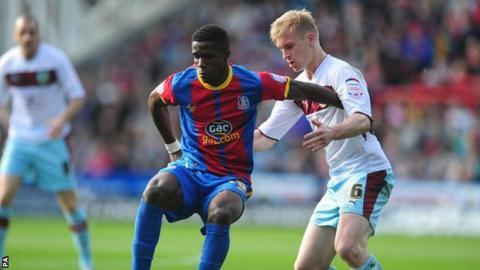 A Wilfried Zaha-inspired Crystal Palace came from two goals down to edge a seven-goal thriller against Burnley. The Eagles are now unbeaten in seven Championship games and have taken 19 points in that period. Chris McCann and Martin Paterson put the visitors 2-0 up, but Zaha responded with strikes either side of the break. Damien Delaney and Glenn Murray put Palace out of sight, although there was time for a late Charlie Austin consolation for Burnley. The result caps a fine week for both Palace and 19-year-old winger Zaha, who scored both of his side's goals in their 2-1 win at Wolves on Tuesday. After losing their first three league games of the season, the Londoners have subsequently won six and drawn one of their last seven matches. It had all started so differently for both sides. McCann gave the visitors the lead as he converted under pressure from close range, then Paterson hooked exquisitely over Julian Speroni from an improbable position on the right. But Palace, buoyed by their fine recent run, responded just before half-time, Zaha collecting a through-ball from Andre Moritz before lashing home. The same players combined eight minutes after the break, with Brazilian Moritz sliding a ball through for Zaha to finish. Delaney put the hosts in front midway through the second half, lashing in via a deflection, before Murray met Dean Moxey's low cross to make it 4-2. Austin pulled one back for Burnley but it was too little, too late. "Wilfried Zaha has decided this year that he is going to commit himself to football. "He is certainly a young man who has got huge potential and hopefully he can fulfil that. "I think this is the place to fulfil it because he is expressing his talent week in, week out in front of a very good crowd. "I have seen him play better than today but I have very high standards with Wilfried." "It is hugely disappointing to lose the game today. "When you score the amount of goals we are at the moment and we're not getting the points that reflects, it's hugely frustrating. "We feel very low tonight. At 2-0 up, we were well in control of the game. "They are a threat with Zaha, he has real quality and we didn't deal with that well enough."